Can religious people save the environment? Can the environmental challenge save religion? Our planet is in trouble, and it will take an amazingly large and powerful force to shift into a more sustainable way of living. Spiritual leader and environmental activist Andrea Cohen - Kiener tells us that people of faith have the numbers, the passion, and the mandate to do it - and that nothing else is strong enough to counterbalance "business as usual." 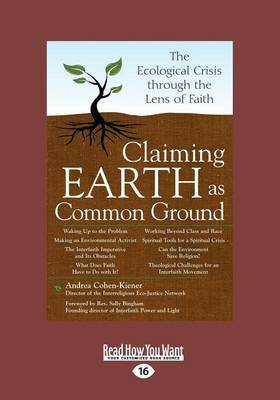 In this urgent call to action, Cohen - Kiener gathers insights from ecology coalitions, emerging theologies, and spiritual and environmental activists to rally and inspire us to work across denominational lines in order to fulfill our sacred imperative to care for God's creation. Cohen - Kiener and contributors clearly outline the shared values of our faith traditions that drive our commitment to care for the earth. Acknowledging the challenges in working together to implement positive change, they present steps - both big and small, for individuals and groups - for reversing our direction from consumption to sustainability.